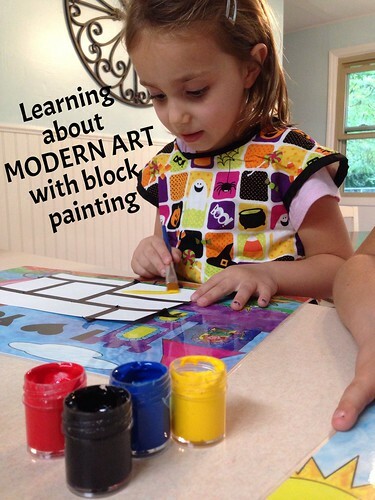 home is where they send us...: More Modern Art for Kids: Piet Mondrian & Color Block! 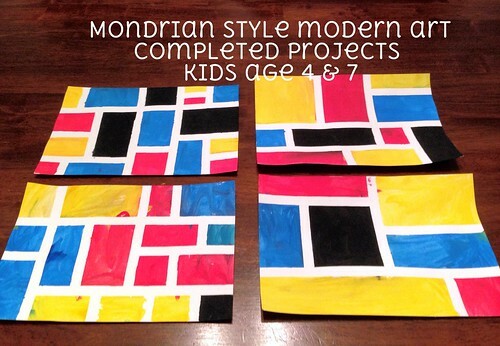 More Modern Art for Kids: Piet Mondrian & Color Block! This blog contains affiliate links that help to support our homeschool! This past month we have been focusing on Modern Art. 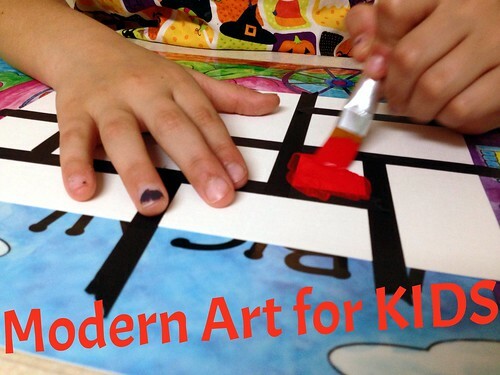 The kids really enjoyed learning about Piet Mondrian! He is famous for his paintings of black lines filled with color. Our materials included (supplied by Kiwi Crate): canvas paper (really, any thick paper will do), black tape (any color would work) and paint! We started by taking the black tape, taping it to the paper and making many different squares. The kids then took the paint and painted each square a different color. When the paint was dry they carefully removed the tape and had their masterpiece! I really enjoyed this project from Kiwi Crate. The kids have learned so much from our subscription and I love seeing them get excited each month when the box arrives. Each box comes with everything we need to complete all the projects - tape, paper, glue, paint, paint brushes. It really makes for a "fun and easy" project for us. Piet Mondrian was born in the late 1800's in the Netherlands. He was exposed to art at an early age. Mondrian started as a school teacher painting only in his spare time. His early paintings were mainly landscapes. When he moved in the early 1900's to Paris his art became influenced by Cubsim (see my blog Modern Art Cubism). His work then moved from natural settings to more geometric shapes. Mondrian headed back to the Netherlands during WWI and met up with another well known artist Bart van der Leck who used only primary colors in his art. This influenced Mondrian to develop his own theory and style of painting. Interested in Kiwi Crate? Click here for a discount on your first box! Want to see our other KIWI PROJECTS? Check Fun with Flight, Playing with Water, More Kiwi Fun and Our Kiwi Review.